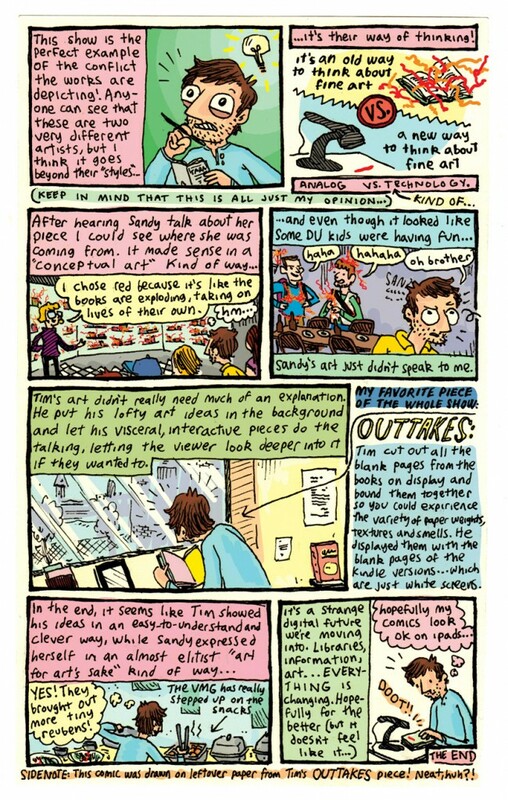 Sam Spina made a comic about my installation at Denver University, Materials On Reserve. I really love it. It is awesome not only to see yourself in comic form, but to have someone really understand and enjoy your art and then go even further and make a comic about it. Thanks Sam! There is only one point in the comic that doesn’t align quite with my own interpretation of the show. Sam talks about my installation as “a new way to think about fine art” and Sandy’s as “an old way to think about fine art”. I don’t see it quite as stark. I find our works to be complementary and more of a conversation between two different ways of working and thinking about a similar topic. There are a hundred ways artists could respond the library as an idea, I just do what interests me and Sandy does what interests her. Plus having the two installations next to one another makes each element of the show stronger through the comparisons of the two styles and opens up the conversation for dialog between these forms.